Vietnamese Lacquer Ware has a history of about two thousand years. In Phu Tho Province, in Northern Vietnam, resins are harvested from the Rhus Succedanea Tree and converted into natural lacquer, which is then applied to paintings and fine art. The traditional lacquer process, as practiced in Vietnam, is complex and requires 75 to 115 days to complete each piece. There are many steps to the production of lacquer ware. Any imperfections in the wood are first sealed with lacquer. The wood is then covered with cotton gauze and covered with a thick mixture of sawdust, alluvial soil, finely ground rock, and lacquer. After drying it is sanded smooth under water. It is then painted with a mixture of alluvial soil and lacquer and wet sanded. The coating and sanding process is repeated at least two more times. At this point the artwork is applied to the piece by hand using any combination of paints, seashell, mother of pearl, eggshell, and other materials. The surface areas of piece without artwork are painted with solid lacquer, while the areas with the design are coated with a special clear lacquer. The artwork is then entirely coated at least two more times with clear lacquer. Finally it is highly polished with wax. Lacquered items have been found in ancient tombs in Vietnam dating as far back as the third and fourth centuries B.C. Over the centuries, Vietnamese master craftsmen and artists have mastered techniques using lacquer for purpose of decoration and preservation. Lacquer traditionally comes in three colors-brown, black and vermilion. By the 1930s, artists started to use a new technique known as chiseling which gives a richer mix of colors and an added sense of size and distance. 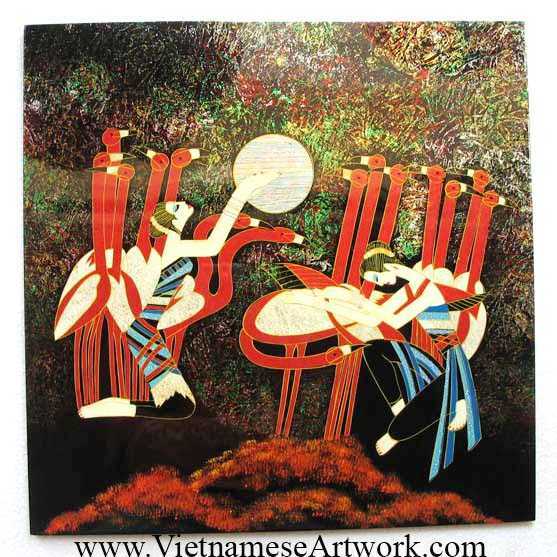 Lacquer paintings became Vietnamese specialties. Each painting has unique character. We are working directly with the artists. These paintings are made by the special order of Asia2you with the best quality and artistically designs. They are made specifically to resist the cold weather in the north America and Europe.